We use Linux for everything and there are a few graphical applications to cut a movie but all of them were complicated to install and required libraries that my older Linux installation did not have. The movie we did is a 5min long movie for a school project and we did not want to make any complicated cuts. We just wanted to assemble the individual scenes into one big 5min movie. As a camera we used a Panasonic DMC-GF3 configured in VGA resolution and "motion jpeg". This results in .mov video files (Apple QuickTime movie files). Here is what we did. It worked very well for us and we had a really nice movie in a very short time. We shot the video in such a way that we did many small scenes. Each one is only a few seconds long and if one scene is shot from different angles then those are as well individual .mov video files on the camera. If something went wrong during a scene then we would simply redo the scene. We did not have to truncate any .mov video files or remove sections from .mov video files. Very simple and easy, very fast. Repeat this process until you have all the scense in place. The concat-list.txt is then the control file for ffmpeg. This command will concatenate the small movie scenes into on big output.mov file. In theory it should even be possible to concat many video files into one with vlc itself that did however not work for me. ffmpeg does a better job here plus you don't have to click around in a GUI to select all the files. 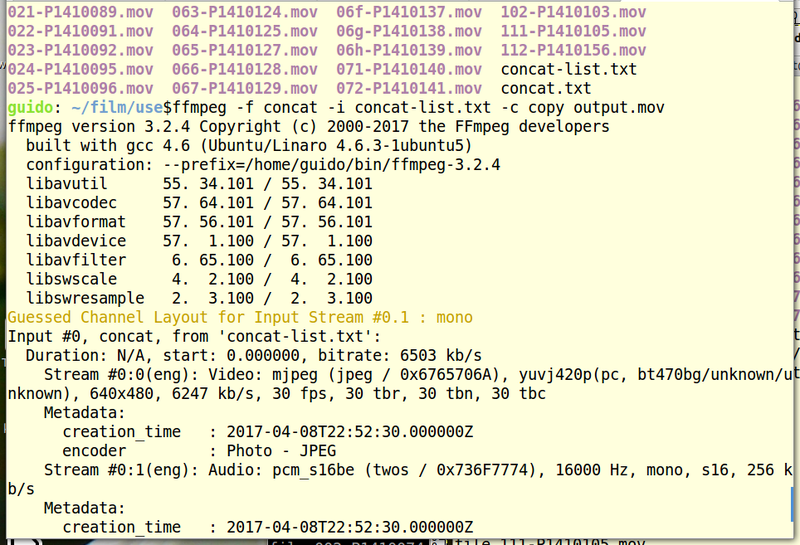 ffmpeg is very fast and allows for efficient batch processing. Concatenating files in the above way does not change the codec and the final .mov file could be compressed further. You can use ffmpeg to change the codec or you can try "online movie conversion" sites. Even youtube does a pretty good job. You just upload your movie to youtube.com and while still logged into your account you go to the "video manager" section where you can see all your public and private videos. Click on the arrow next to the "Edit" button and you can download the video again as mp4. It is usually a smaller file and better compressed than the original .mov file that you uploaded.